That’s really effective! I’ve heard of that technique & do have some of the pens (dad found them in the back of a cupboard & passed them to me, handy), but keep forgetting to try it out, will do so now. And good to know the colour stays fast once it does dry completely, I’d wondered about that. Blue, I’d be careful with that aspect – I do think it all must be liquified in order for it to not reactivate once dry. I’ve been finding that it’s fun to liquefy some areas and not liquefy others the first go-round so….liquified areas I do believe would not re-activate, but any that were left dry would. I’m glad you enjoyed this and that you have some on hand! Great effect and look at your artwork growing. Wow! You are surely an inspiration! Thanks, Jodi, considering the time I put into it, I hope I’m seeing something come from it lol. I do feel my florals are getting better. They’re much more fun to do than they were at the beginning because I’m more used to them. Every time I change subjects though, it’s Iike coming in brand new again. You are growing LEAPS and BOUNDS and your efforts are surely showing! You have such great discipline – I’m so all over the place LOL! I don’t know why I’ve been so obsessed with art for a year, but starting this blog and getting lots of encouragement from people like you have really helped! I just can’t stop. I’m still surprised whenever I like something I did. Hehe it’s cool. Thanks Jodi. Aw thanks Harmonie! I’m so glad you liked it! Those pens are very popular here in Sweden but very pricey….3-4 bucks a pen…and not much cheaper in the group packages. Funny, I like them for writing but never thought of using them because they run when water is applied…but I love the effect and will think of them differently now. Thanks for the demo on these pens Laura. 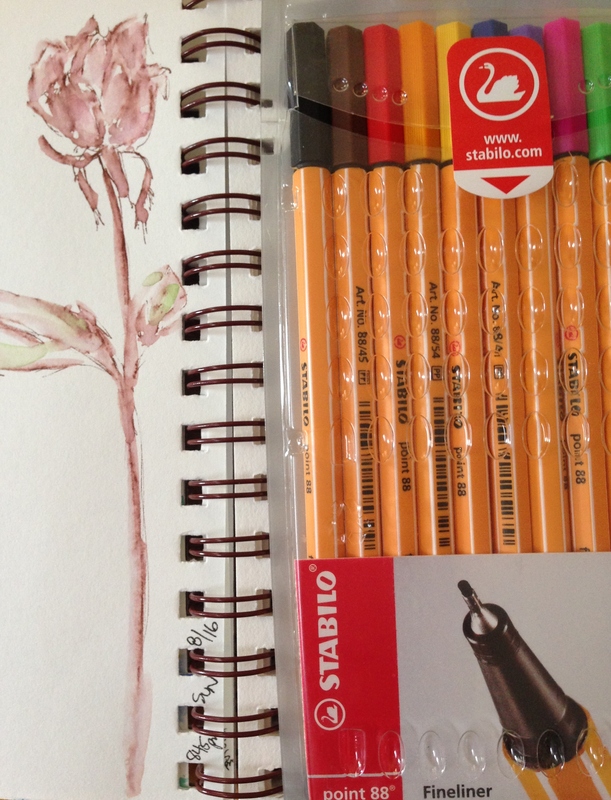 I have a set of Stabilo, so I’ll give them a try today. I’m just getting ready to draw Wednesday’s art, maybe I’ll include them in the process. Good to see you enjoying techniques and nice outcomes. I like working in reverse with pencils, then water, then ink. But this is a new one to try. Thanks for sharing! Absolutely! I hope you enjoy it, or find a way to work it in to your own process. What a great effect. I’m putting those on by Blick list. Yay! Oh, I should work for them. I hope you enjoy them, Kirk! Thanks, Johanna! I’m glad to have inspired you! Love the standing rose with added water. Pens sound great. Thanks! I hope you get a chance to test them out. Isn’t it fun, Janette? I just love the effect! Beautiful Laura! The Rose is my favorite. Aw thanks! I really enjoy working with these pens. Thanks Jill! Nope, just the brown fine liner. It may look like there’s pen in there but that’s just the parts I didn’t hit with the water. For me, I like the effect with some hard and soft lines mixed. They sound like versatile pens! Thanks for sharing yet another cool tool with us. 🙂 Pretty flowers, too! Thanks, Teresa! I hope you’re able to play with them. Such cool tools. I totally love them. I hear ya tho. Their S&H can be a bear, unless you’re placing a large order….which I try to do, much to Hub’s dismay. lol! Your flowers look great and love the effect of the pens. More fun things to try out, thank you for sharing. Peace. Thank you for your visit and comment! Glad you enjoyed. This is a very cool drawing – I do think that florals are a subject that you have definitely got a feel for because the end results are always beautiful. 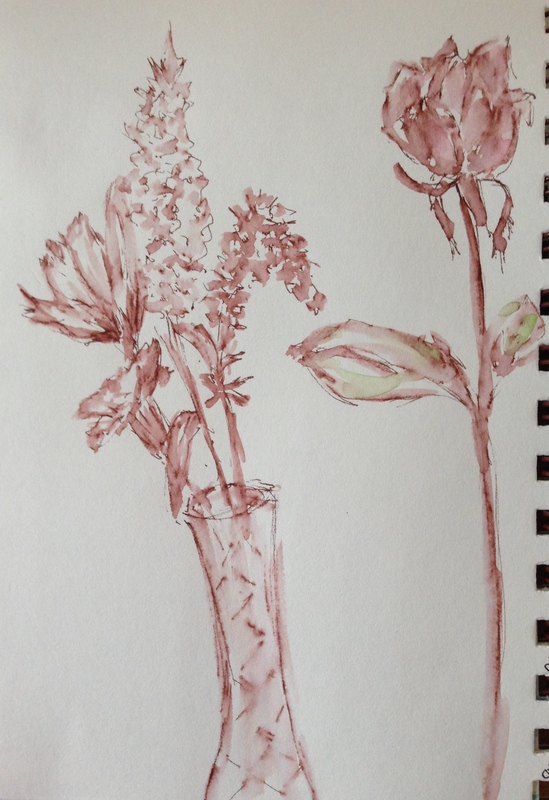 The simplicity of the flowers and quiet watercolor that is applied are a perfect balance. Very nice Laura! Thank you so much, Mary. My 16 yo cat (Penny) has been ill, and the flowers have really helped me to focus on something beautiful. I will hopefully have a chance to do some more tonight. I’m really glad you like them. I value your input greatly!! Your florals are soooo amazing, as is all of your work. Oh these must be the pens! I just needed to read the first posts rather than the last one 🙂 Really lovely, rose. Just love the simple beauty you achieve!! …thank you for including this photo which I have located, with your help. They look interesting, but for me, challenging. I only know brushes so far. I’d love to see what you created just messing around. I do liquefy the pen with a brush – just a very light touch. Perhaps you’re better off staying with watercolor, as you’re so wonderful at it! If I felt I was really good at any one medium….but that’s for a future time (if any). Thanks for your comment, as always. That’s so cool! 😀 I’m so glad you’re enjoying them!